Do personalities matter; or do they dissolve in the sea of circumstance? Then Trump’s dilettantish, dreadful selection of subordinates generated an additional, autonomous impetus to war. (e) USAID Administrator, Mark Green. Pence was a Congressman from Indiana from 2001 to 2013. The Tea Party wave floated Pompeo through four Congressional elections in the 4th district of Kansas. Green won four victories in Wisconsin’s 8th district; then narrowly lost the 2006 Wisconsin gubernatorial election. Pence won the 2012 Indiana gubernatorial election. Abrams and Bolton are bureaucrats. They’ve all got religion. Abrams wrote four books on faith. 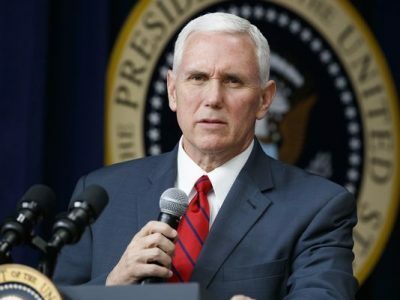 Pence and Pompeo are born Catholics, born-again Evangelicals. Pompeo is a deacon and Sunday school teacher. Pence’s Christian-based traditionalism explains his electoral success. Green, a Catholic, relied on pro-lifers for an electoral base. Congressman Green championed religious freedom, particularly overseas. Bolton, although a Lutheran, cultivated ties with Armageddonist, pro-Israel elements from the Bible Belt. With birth-years ranging from 1948 to 1963, Cold War anti-communism molded each man. Abrams, especially, plays the Red Scare card, and justifies his Central American crimes as necessary lesser evils. Pompeo associated with a website that called Obama an “evil Muslim communist.” Venezuela’s United Socialist Party naturally became their communal grindstone. Pompeo, Bolton and Green have working class roots. Abrams’ father was a lawyer. Pence’s father, himself of humble origins, prospered as vice president of a mid-sized Midwestern gasoline retailer. Except for Pompeo, all professionally immersed themselves in politics while in their twenties. Pompeo earned an engineering degree in the Army and later managed manufacturing plants in Kansas. He first ran for Congress aged 37. All five are lawyers. Abrams started amidst elitist Democrats like Daniel Moynihan. By 1980 he was a Reagan man. The rest are Republican lifers. Bolton led his high school’s Young Republicans for Goldwater club. But for Trump’s triumph none would hold top government posts. Two years ago, except for Green, none dreamed they might soon be elbows deep in Venezuelan intrigue. They do possess impressive foreign policy creds. From 2003 to 2013 Pence sat on the House International Relations Committee (HIRC, later Foreign Affairs). Pompeo sat on the Intelligence Committee and the Sub-Committee on the CIA. Green spent 6 years on the HIRC. Thereafter Green served as Ambassador to Tanzania then spooled through aid philanthropies for several years culminating in his 2014 appointment to the presidency of the International Republican Institute (IRI). He left IRI to become Trump’s USAID Administrator. At IRI Green survielled and discussed Venezuelan domestic affairs. IRI is one of several overlapping departments and quangos that assumed much of the skullduggery which had been the CIA’s preserve during the Cold War. This consortium includes: USAID, National Endowment for Democracy, National Democratic Institute, plus a dozen European counterparts and likeminded foundations. This consortium’s political component channels $1 billion annually. It employs a few thousand Western professionals and several times that number across targeted countries. They’ve executed coups in Haiti, Honduras and the Ukraine. The Polish ruling party is indebted to them as were the Arab Spring’s instigators. They have financed Venezuela’s opposition for 20 years. Green is key because the Venezuelan War’s preliminary bouts consist mainly of using USAID shipments to: dramatize the plight of Venezuelans; embarrass Venezuela’s government; empower oppositionists; provoke conflict; and smuggle weapons. Green has established airport bases at: Boa Vista, Brazil; Cucuta, Colombia; and on three Dutch-controlled islands off Venezuela’s coast (Curacao, Aruba and Bonaire). Green shuttles between these locales and USAID depots in Miami, Houston and Puerto Rico. Abrams is the old-hand at re-purposing humanitarian aid, human rights propaganda, and democracy movements. He was Assistant Secretary of State for Human Rights and Humanitarian Affairs from 1981 to 1985. As Assistant Secretary of State for Inter-American Affairs (1985-89) Abrams micromanaged terror campaigns in El Salvador, Nicaragua, Honduras and Guatemala. In Guatemala Abrams aided and abetted General Rios Montt’s slaughter of tens of thousands of civilians; crimes the UN-endorsed Commission on Historical Clarification defined as “genocidal.” In Nicaragua Abrams smuggled weapons inside humanitarian aid shipments. Regarding El Salvador Abrams covered-up the El Mozote massacre and Archbishop Romero’s assassination. Abrams is a shameless liar. He was convicted of lying to Congress regarding Iran-Contra. In a letter to the New York Times denying Guatemalan atrocities Abrams fabricated evidence from whole cloth. Examples abound. Abrams vanished in the 1990s only to re-appear as Bush’s “Democracy Czar.” In 2001 he became the NSC’s Senior Director for Democracy, Human Rights and International Operations. From 2005 to 2009 he was Deputy NSA for Global Democracy Strategy. Abrams figured prominently in Venezuela’s failed 2002 coup. Abrams deploys democratic rationales where possible but routinely defends autocratic allies. Rather than debate critics who call out his hypocrisy, he accuses them of being commie spies. He had one critic deported. Abrams knows the short-comings of velvet revolutions. He spent decades trying to topple Sandinistas, Chavistas and Castroites; and their still standing. Thus, Abrams repeatedly calls for dispensing with formalities and militarily smashing Nicaragua, Iran et al. At Pompeo’s suggestion Trump named Abrams: Special Representative for Venezuela. (Abrams began work January 25, 2019.) He’s a PR catastrophe. This cross between Bela Lugosi and Adolf Eichmann may be the most reviled man in the Latin Caribbean. Pompeo was Trump’s CIA Director until Tillerson’s untimely departure created an opening at State. Pompeo’s expansion of the CIA’s drone assassination program coincided with a drone assassination attempt on Venezuelan President Maduro. Bolton is another liar. He lied about Cuba’s bio-weapons program. He lied about Iraq’s nuclear program then lied about telling those lies. Bolton practises “politics disguised as intelligence” i.e. choosing outcomes then distorting intelligence findings to facilitate those outcomes. Bolton withholds facts from superiors. In truthful slip-ups Bolton confesses to a perceived duty to lie. For reasons untold Trump delegated the Venezuela file to Pence who for reasons untold embraced it with ardour. The composition of Pence’s cabal guarantees war. All are blinkered holier-than-thou Red Scare cranks. 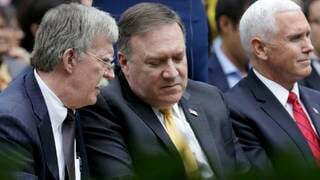 Pompeo, Bolton and Abrams habitually monger unilateral pre-emptive aggression. Delusional group-think already manifests in collective denial of Maduro’s formidable domestic and international support. Now the scary part. The resolve to do unto Venezuela as has been done unto Syria emerged not from Trump’s Administration. No, this agenda arose from Democrats and their European overlords. Thus, the Mad Hatter’s party over which Pence presides hatches its war plans absent any check or balance. Uneasy layeth the head.